Right mouse click on tag name (see attached image) allows to select html tag with content. Is there keyboard shortcut for this action? Is there shortcut to select content only? I know about Ctrl+W. But too many clicks (3!) required for this action. Did somebody find the way for quick whole tag selction via one action|/shortcut? Unfortunately, there is no such shortcut. Please vote/comment for: https://youtrack.jetbrains.com/issue/WEB-16421 . Right mouse click on tag name (see attached image) allows to select html tag with content. Is there keyboard shortcut for this action? On a Mac, I believe if you place the insertion point in the tag and then repeatedly press opt-up-arrow until the selection covers the starting and end tags along with what ever content is between the starting and end tag. For documentation, choose HELP -> DEFAULT KEYMAP REFERENCE. Look in the Editing seciton for "Select successively increasing code blocks" for the keyboard equivalent. Is there shortcut to select content only? Yes, there is a shortcut. To select content, place the insertion point anywhere in the content. 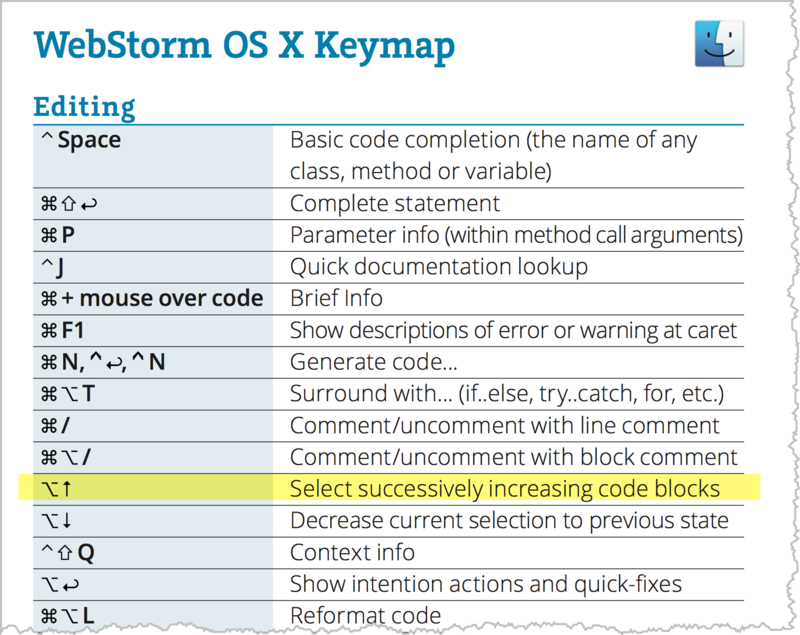 See "Select successively increasing code blocks " above for keybaord equivalent.